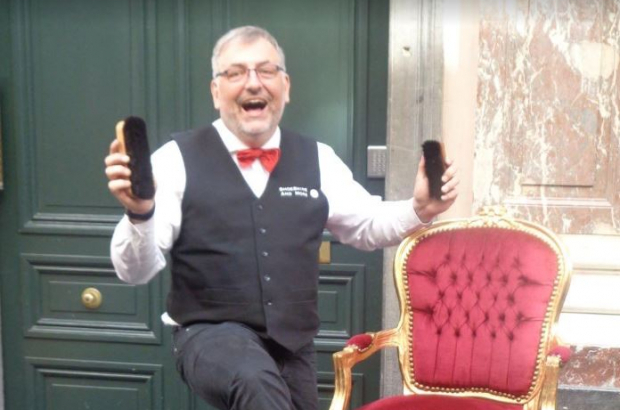 The best shoe shiners from all over Europe will descend on Brussels on 26 May for the first-ever European Shoe Shine Contest. The event, from 11.00 to 19.00 at the Galeries Royales Saint-Hubert, is the brainchild of Marcello Faraggi, president of the European Shoe Shine Association. He approached the office of Brussels' city councillor for economic affairs, Marion Lesmesre, and she immediately saw the potential in the idea. "With mutual respect between the service provider and the client, this is a trade that deserves to be highlighted," Faraggi said. "You just come by and the participants will shine your shoes at no charge. We will also have a free prize draw with high-quality shoe products as prizes." The best shoe shiners will win a golden brush together with a €2,000 prize in several categories: technique/quality, customer service and best entrepreneur. Faraggi decided three years ago that it was his calling to take care of shoes and interact with customers. "I had other careers before - before I was filmmaker," he says. "But this is the nicest one and I’m so happy that I’ve chosen this." He says it makes economic sense to patronise a shoe shiner: "Buying high quality shoes is part of the equation but proper care including shoe trees, good products and regular shines, all of which you can get from the shoe shiner, will make them last a lifetime."